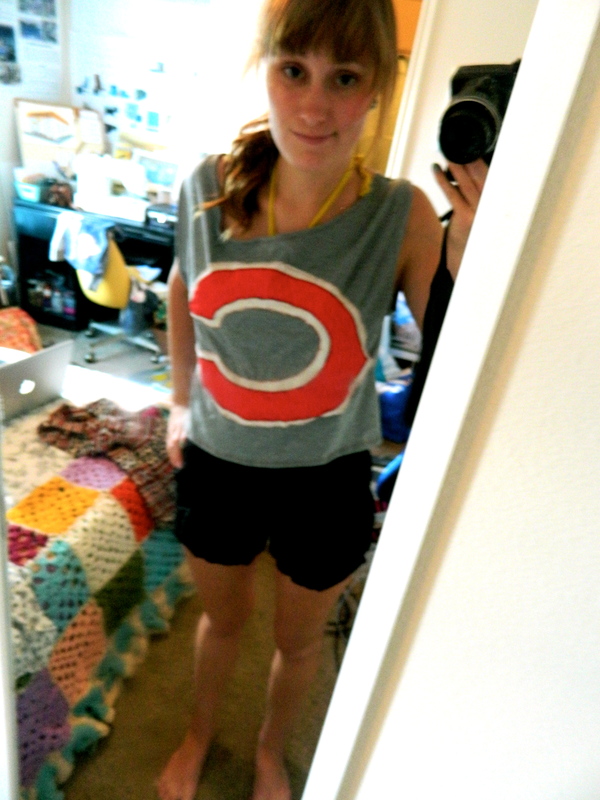 I haven’t done a DIY in a while… it’s also gotten rather warm here in Cincinnati. Both of these things inspired me to come up with this little project just for you all! I don’t know about you, but I’m pretty into this whole cat clothing trend… I’m not ashamed to admit I own about sixish cat related clothing items. I don’t really plan on preventing it from expanding either. That’s just me though. Maybe you’re not crazy like me. Anyways, I started out with a simple white t-shirt (like one of the ones that come in a three pack at Walmart) and some fun fabric. 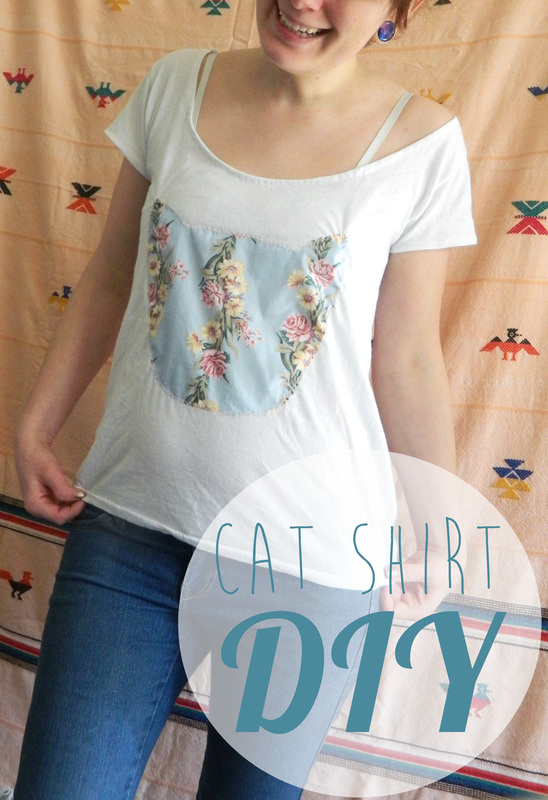 Of course you don’t have to make a cat shirt. It can be anything really. I made something similar using a heart shape last summer! 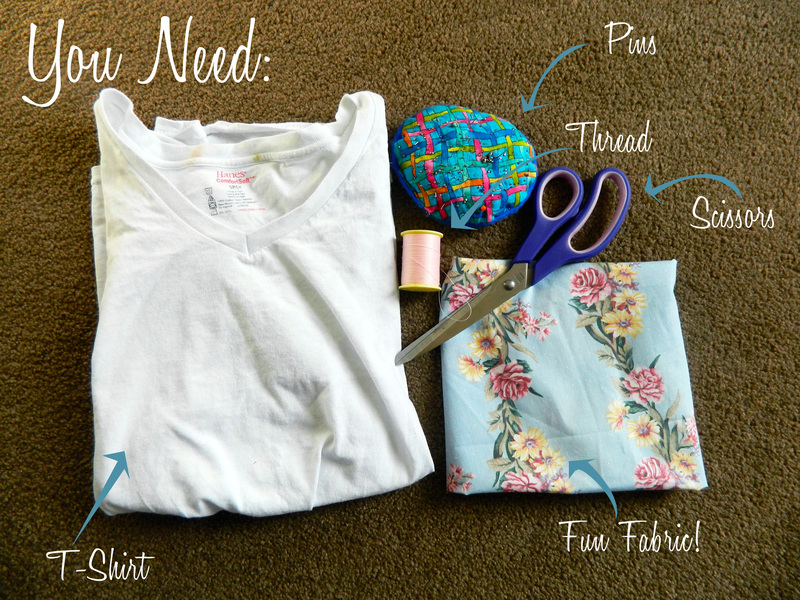 First thing you need to do is cut a new neckline. 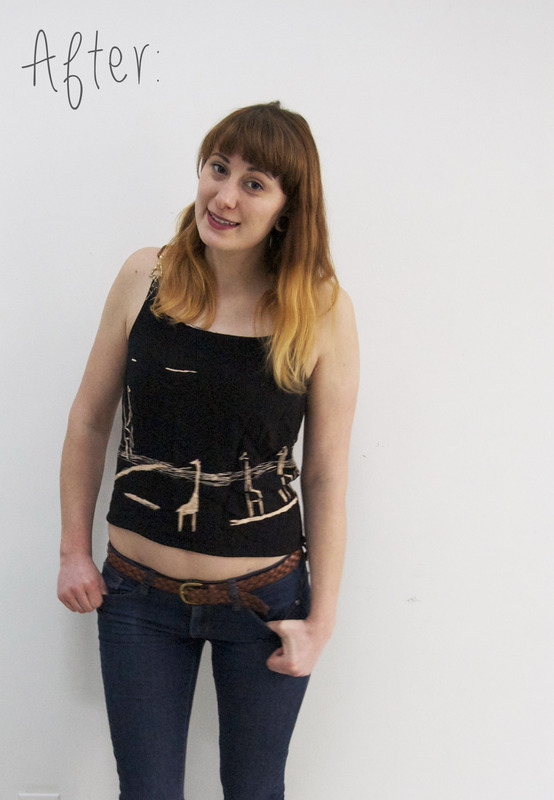 I wanted my shirt to be kind of off the shoulder, so I cut it wide. I also wanted shorter sleeves, so I cut those as well. 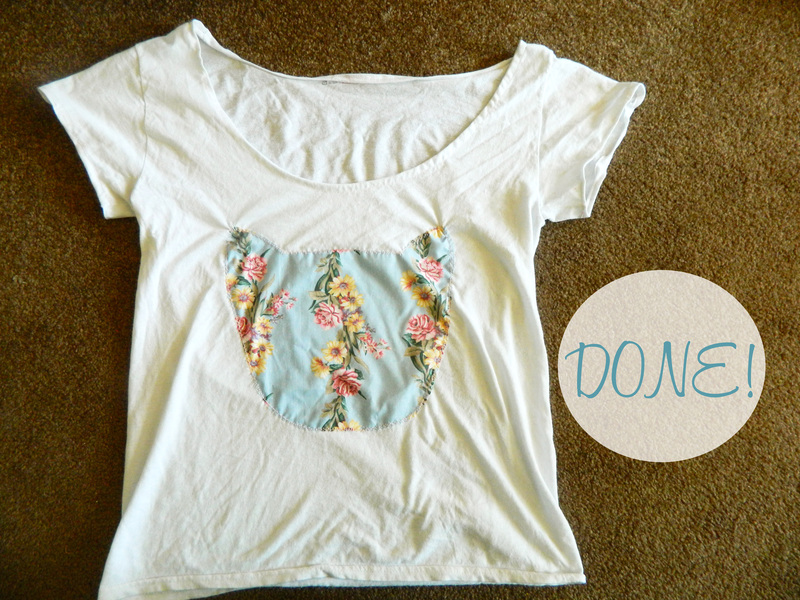 Pin down a hem for the neckline (and the sleeves if you’re cutting them!) 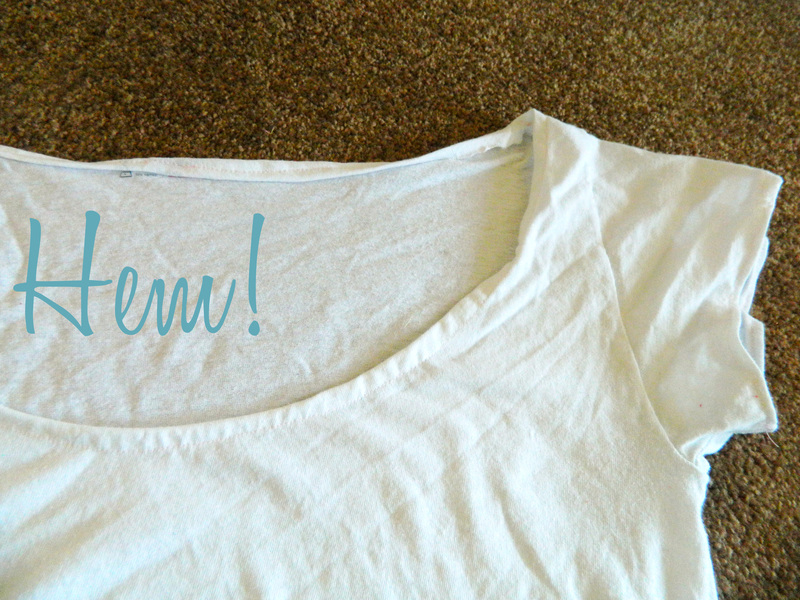 Make sure you do this with the shirt inside out. 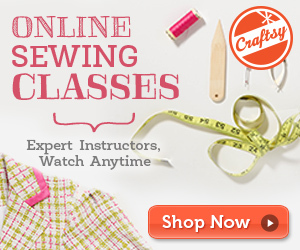 Now use your sewing machine to stitch down the hem! 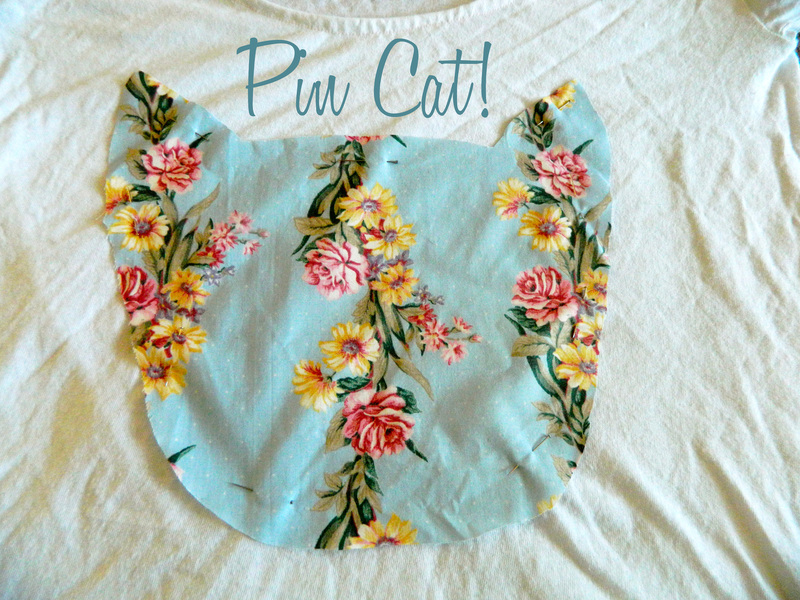 Draw the cat (or other shape) on the back of your patterned fabric, and then cut it out. Pin the cat to your shirt! 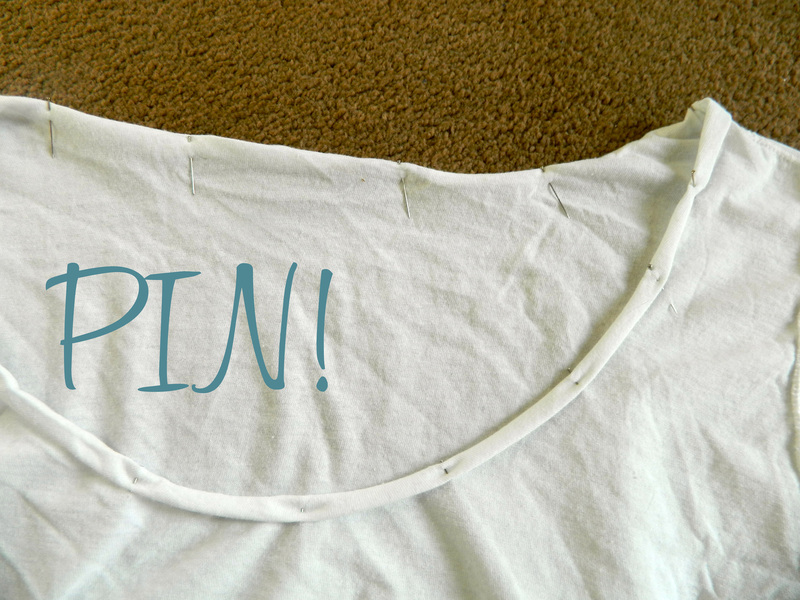 Make sure you only pin it to the front layer of fabric. 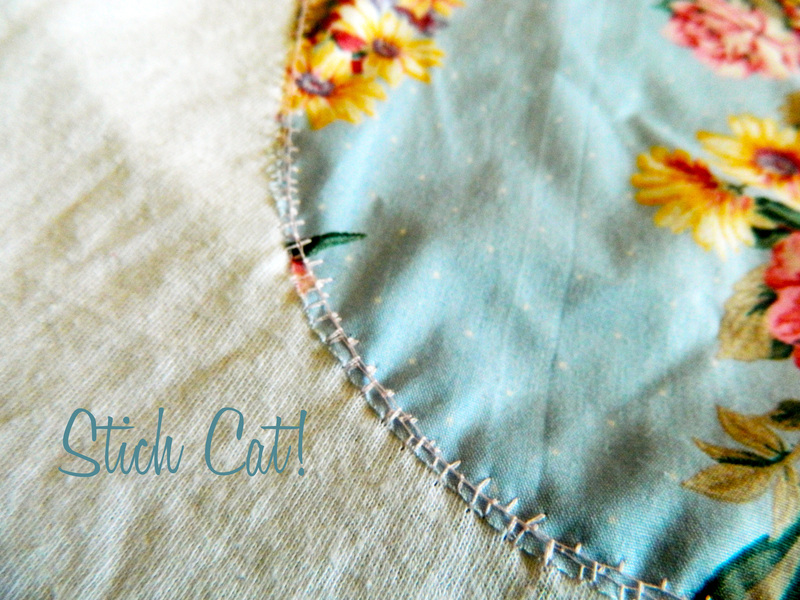 Now it’s time to stitch on the cat. I used a zig-zag stitch and went around the entire shape twice. 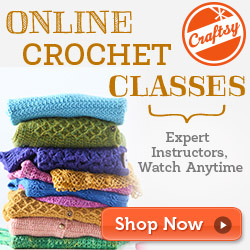 This will make sure your cat is definitely secure, and keep the fabric from unraveling too much. Gaze at your work in awe! 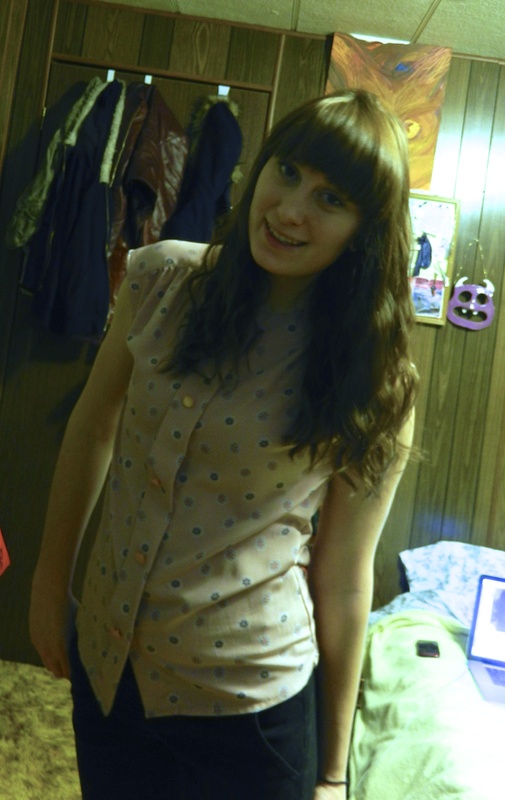 I love this shirt a lot, and not just because it’s cat related. I love the breezy and laid back fit it has to it as well! 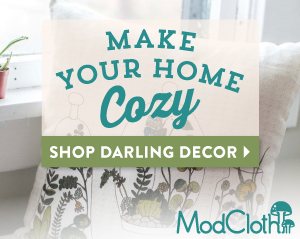 If any of you make this DIY I’d love to see the results! 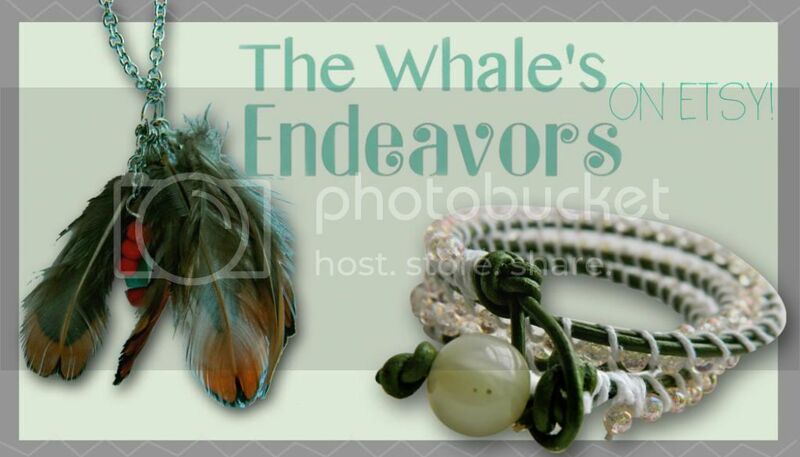 Like TWE on Facebook for updates! 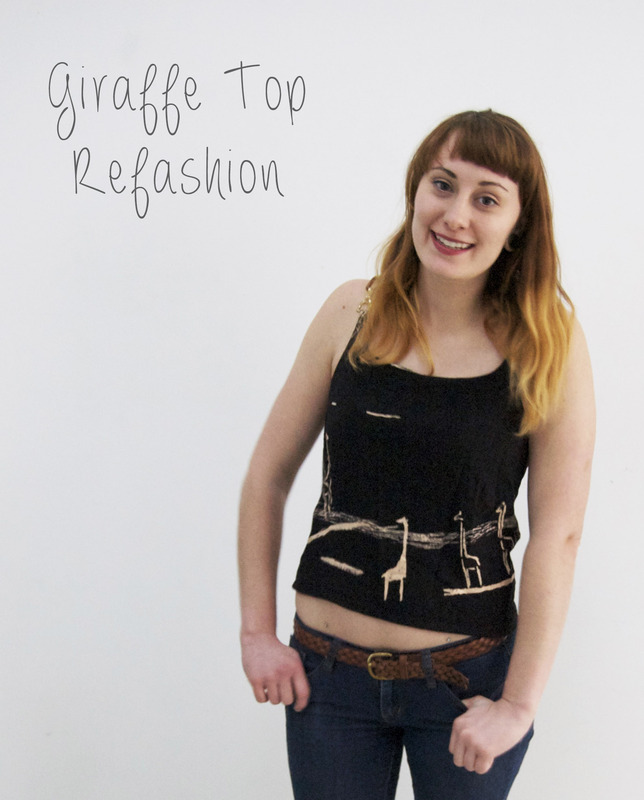 I have a new upcycle today! It was a simple one, but I love the results! I found this shirt at my favorite Cincinnati thrift store a bit ago (along with some other things you will see on here shortly!) 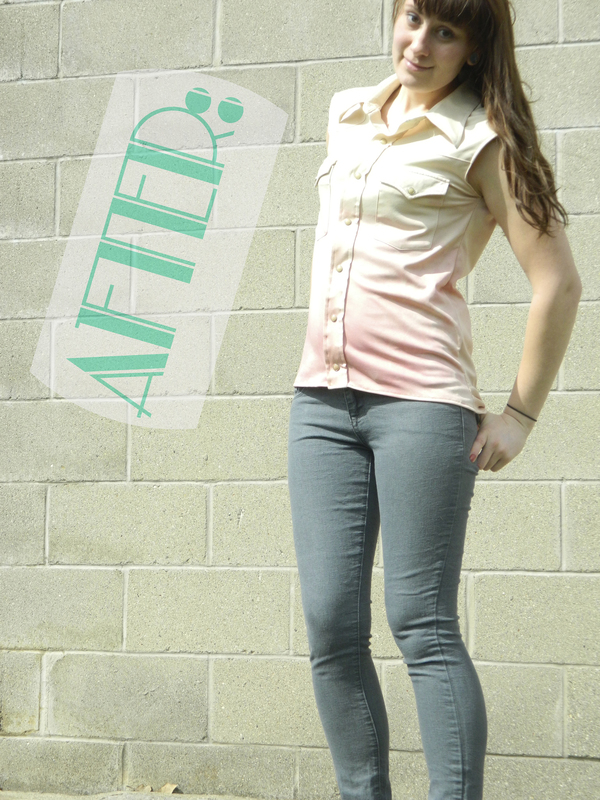 I do believe I’ve mentioned my love for chiffon on here before… but in case you missed it, I LOVE chiffon! Well now that that’s out in the open, I’ll get on with it! This top really didn’t need much. I already liked it, except for one thing: the sleeves. I hated the weird elastic part that tightened the ends of the sleeves to my arms. 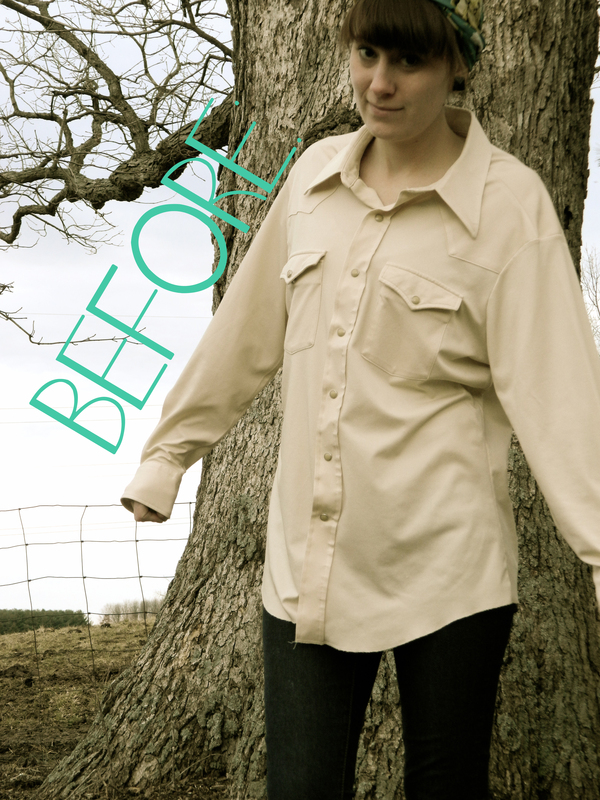 So, for this upcycle I simply trimmed off the said elastic part of the sleeves and hemmed it all up. I also took in the sides a tad. It was so easy. 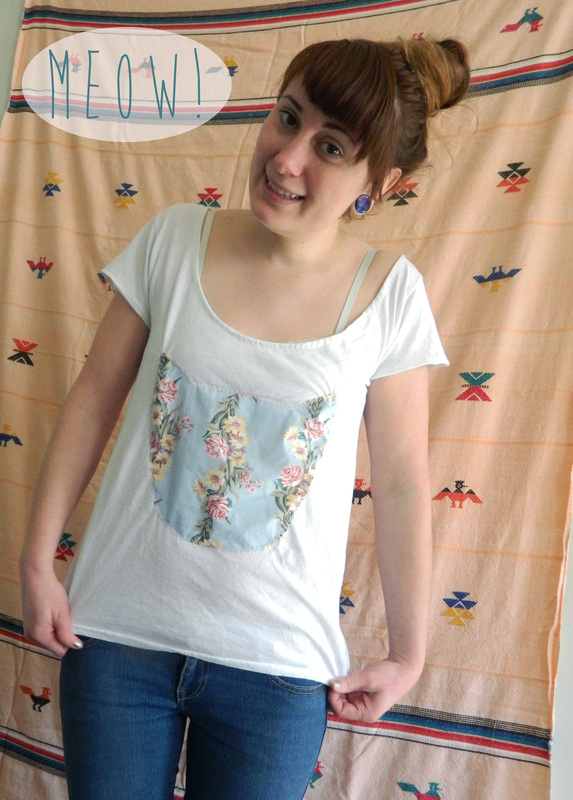 I almost feel like I’m cheating you all for not having done something more impressive… but I love this top! ps: Follow me on Instagram if you’re into that sort of thing! 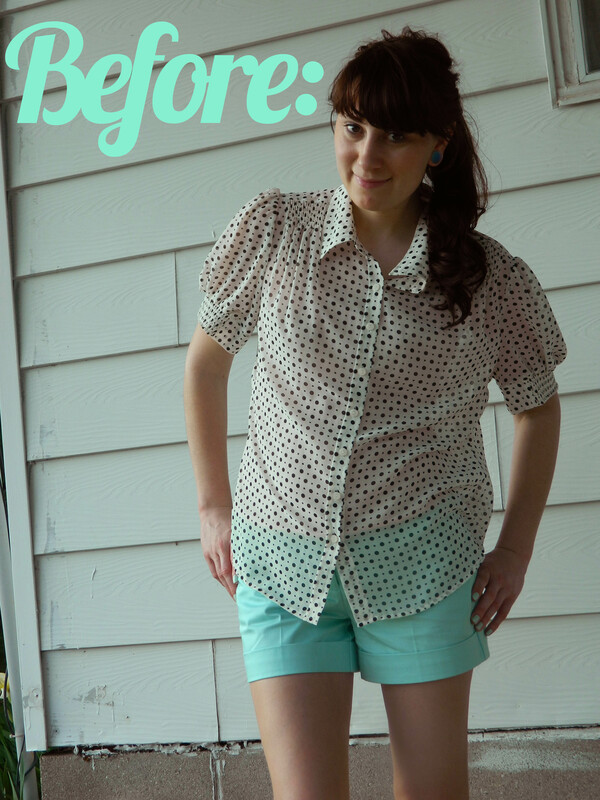 I have a new upcycle today! 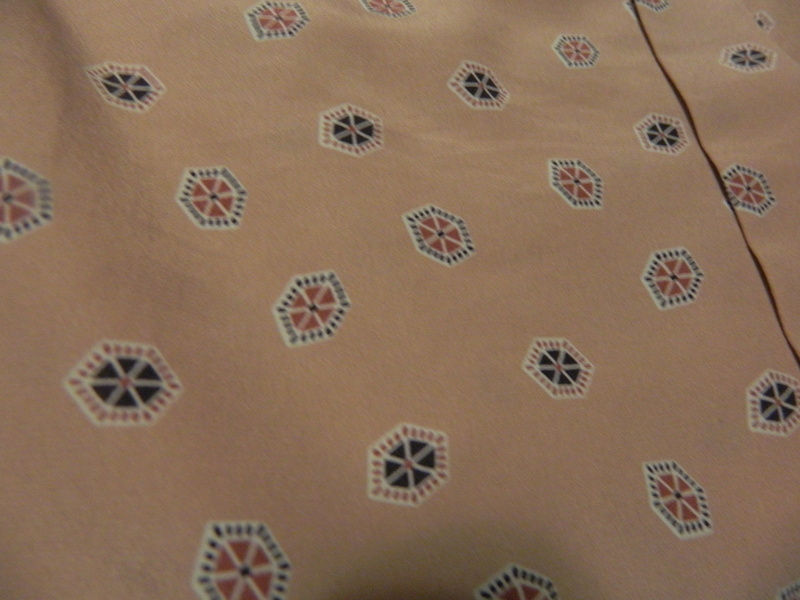 I had bought this men’s button up at Goodwill a bit ago. It didn’t really take long for me to decide what I wanted to do with it. 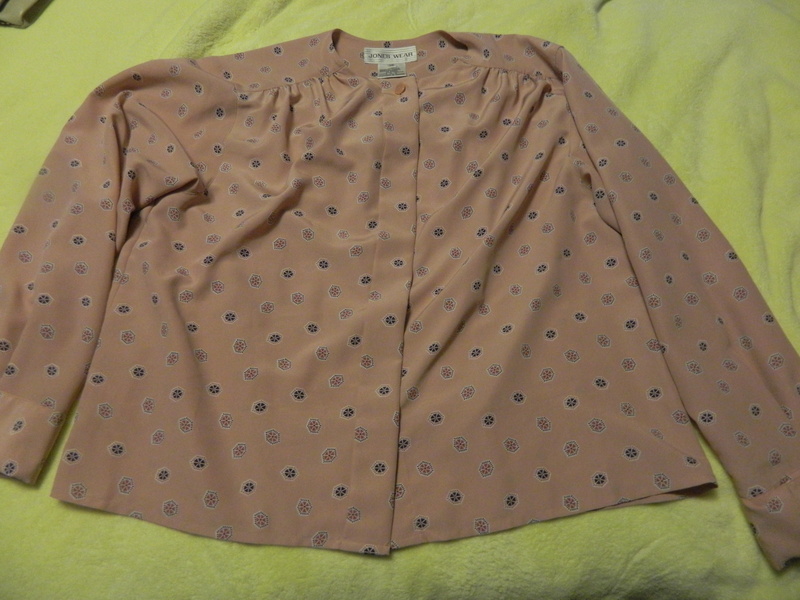 It was obviously huge one me (an XLL) but I loved to fabric and the buttons! 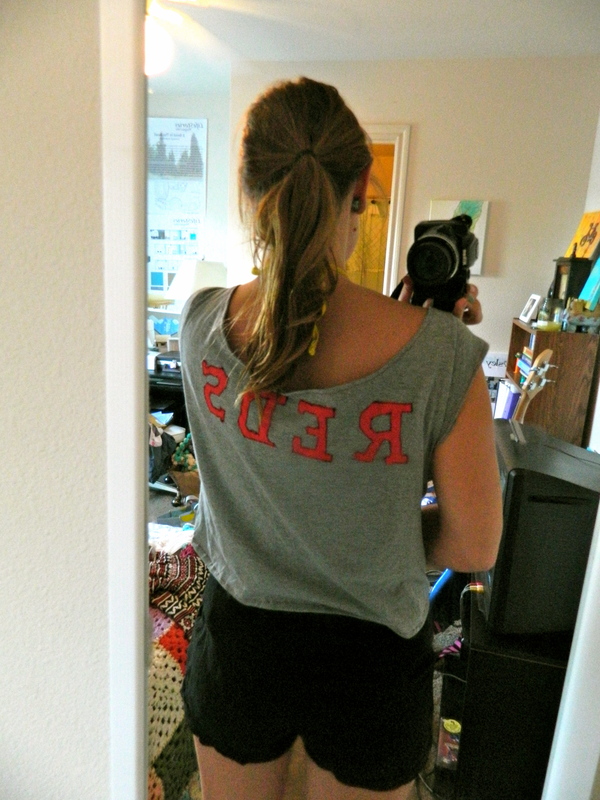 I know I always cut off sleeves… but I did that again, and took in the sides enough to fit me. I also cut off a lot of length in the front, but left the back the original length. I like that look and its been popular lately. 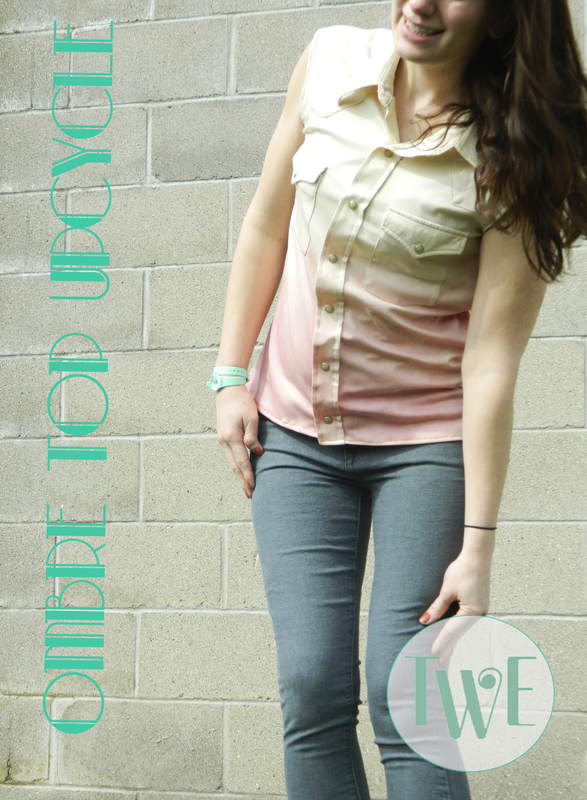 I still felt that this top needed something different, so I decided to try and go for an ombre dye! 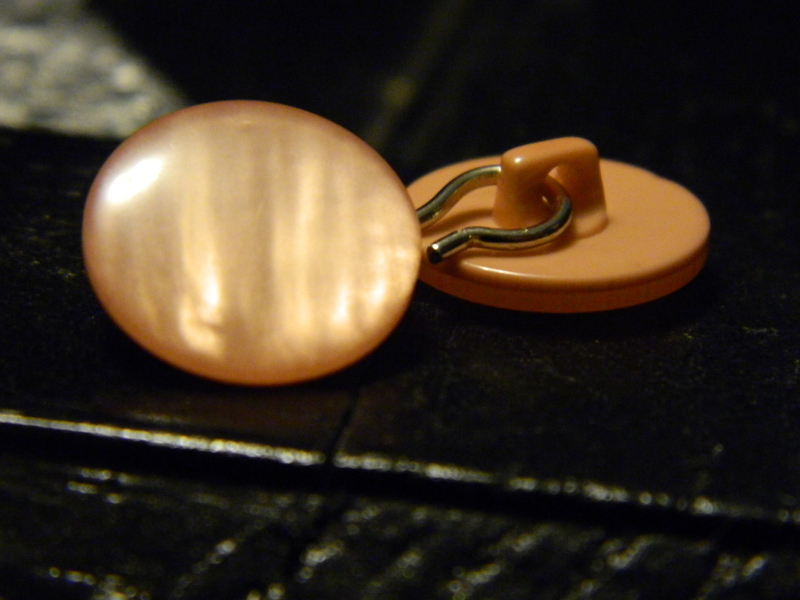 I picked out a pale pink and used this tutorial to accomplish what I wanted! What are your thoughts on the ombre look? 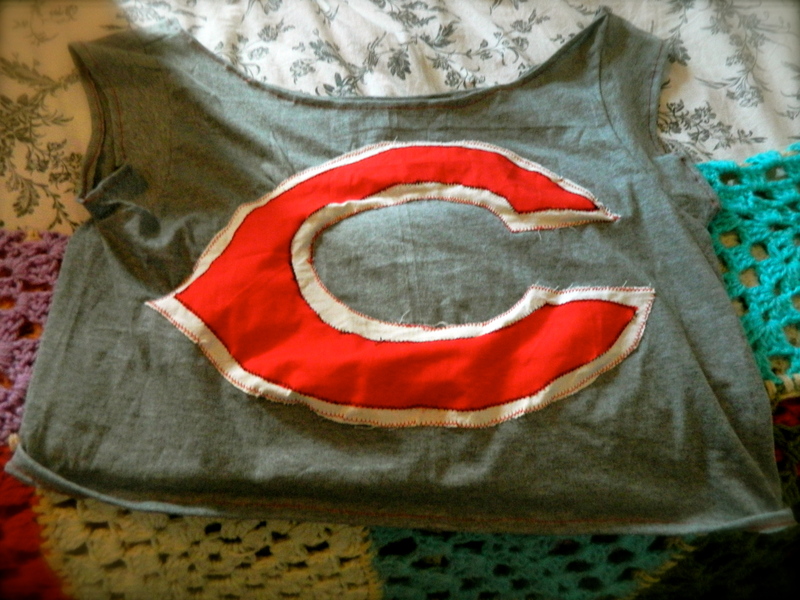 So I had been wanting a new Cincinnati Reds shirt for awhile. Baseball is for certain my favorite sport. I love going to games. The atmosphere is something that you just can’t find anywhere else. Anyways, I’m a poor jobless (but searching diligently!) 22 year old… in other words, I can’t afford a new shirt. I can’t afford milk. 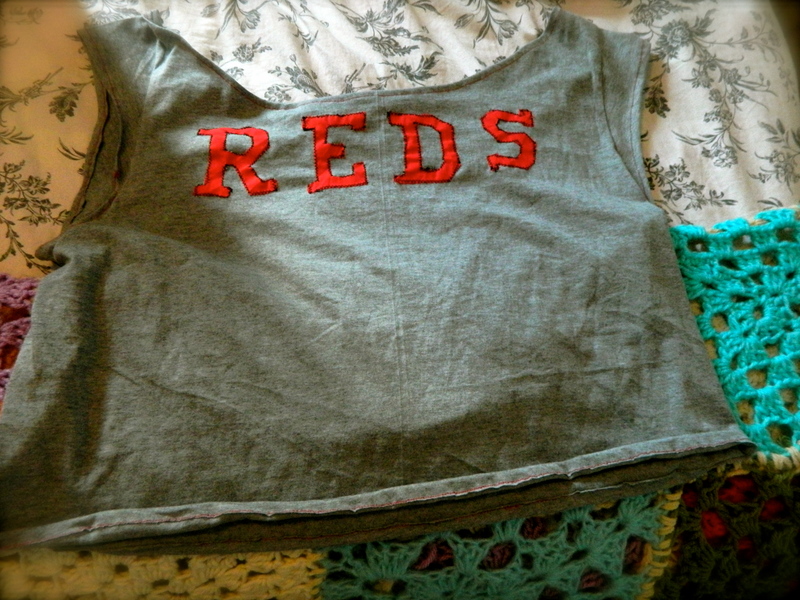 In light of my predicament, I decided to take it upon myself to just make myself a new Reds shirt! 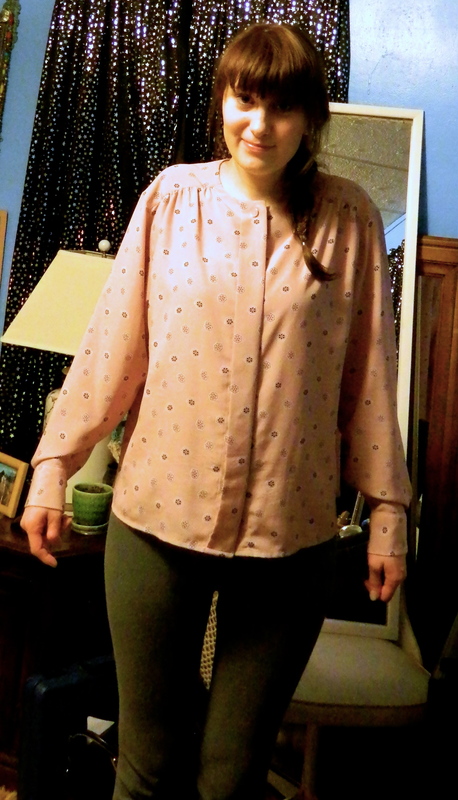 I had a few medium mens shirts from a pack I bought to make my brother a birthday present… and I had upcycled one of them before (post about it here) so I decided to just go along with that again. 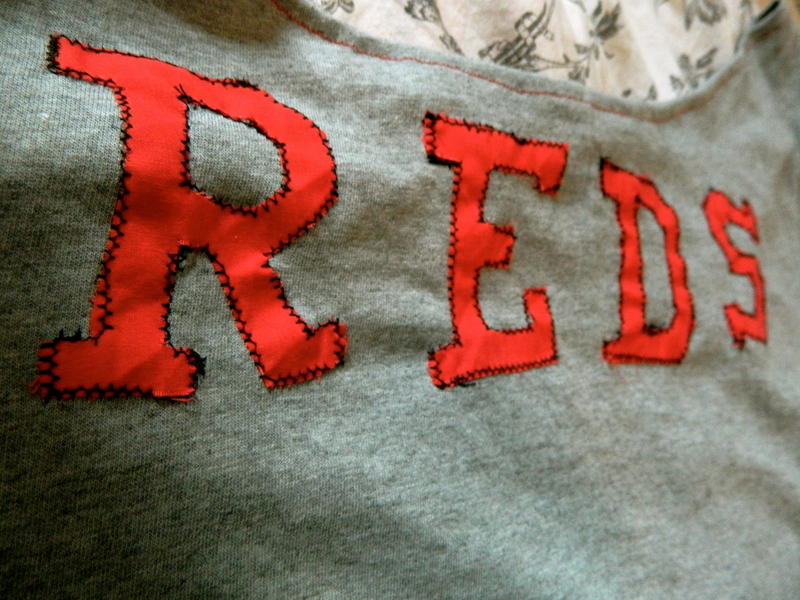 I used some of the handy fabric I have in my closet (thank goodness I had red!) and got to work! Well I hope you all like it and are inspired to try some new creative things yourselves!